Police arrested a driver in connection with a deadly crash at the Venice boardwalk, police said Sunday. Nathan Louis Campbell, 38, was booked into the Los Angeles County Jail in lieu of $1 million bail on a murder charge after turning himself in to authorities about an hour after the crash, police said. 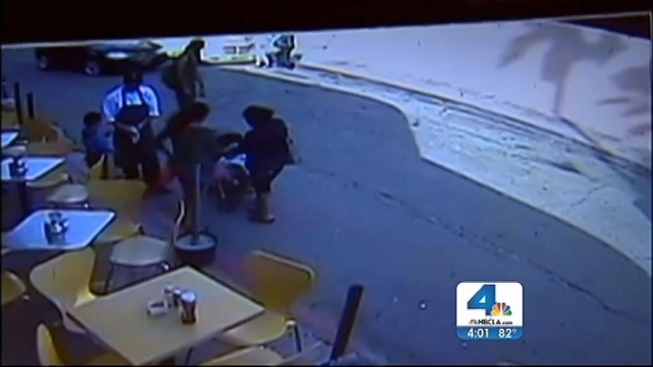 Detectives believe the suspect intentionally hit pedestrians, said LAPD Lt. Steve Lurie. Alice Gruppioni, 32, of Italy, died about an hour after the 6 p.m. Saturday crash in the 100 block of Dudley Avenue, Los Angeles County Coroner’s officials said. The crash also injured 11 others, including one critically. Gruppioni was on her honeymoon. Her husband was injured. Security video shows the suspect parking his black car alongside the seaside boardwalk as the sun sank, surveying the scene for several minutes before getting back into the car and speeding into the crowd, sending people scrambling. According to witness accounts and surveillance video, the man swerved around yellow poles meant to prevent cars from getting into the pedestrian-only area and onto the boardwalk. The car raced off with people screaming and cursing as it sped away. The suspect allegedly abandoned the car at Ocean Park Boulevard and Beverly Avenue before running, police said. Police found the car and called in the bomb squad to check it for explosives as a precaution. The car had paper plates from Colorado. The suspect turned himself in at the Santa Monica police station, police said. A search of his name with the same date of birth in Los Angeles Superior Court records online showed convictions in 2002 for resisting arrest and being drunk in public. Police did not confirm the information on Sunday. A police source said Campbell is known to law enforecment in Southern California. Witnesses said the crash appeared intentional as a black or blue Dodge Avenger swerved on and off the curb as it careened at a crowd of pedestrians at the popular tourist destination. "I seen a girl ... she was latched onto the hood ... she got shook off," said Neqo Habibi. "He swerved two times and she rolled off and was heading straight for us. "It looked like he had no other care in the world." "Still feeling pretty rattled after jumping out of the way of a lunatic driver on Venice yesterday,” wrote Twitter user @Roxanne_Roll. “Cup of tea and marmite toast is helping." The site isn't far from the Santa Monica Farmer's Market where a 2003 crash left 10 dead and 63 hurt, after an 87-year-old man's car accidentally roared through the market.